Please follow the measuring guidelines outlined below to ensure your glass inserts fit correctly. These measurements are also required to make a request for price quotation. Note: please allow for a + / - 1/16" cutting tolerance. Now measure the height of the rough opening. Lastly, deduct an additional 1/8" from the width and from the height measurements of the rough opening in your window, cabinet or door. 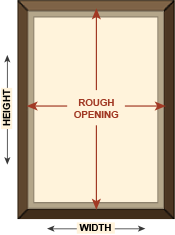 For example, if the rough opening measures 14" x 24" - you would order a glass insert that is 13 7/8" x 23 7/8". Important Note: We supply all cut-to-size glass with square corners unless otherwise instructed. Some window or door inserts may require rounded corners. Examine your window or door opening carefully to determine your requirement. Small "dime shape" corners cost slightly extra and must be specified at time of order. Larger rounded corners will require templates and are quoted on a per project basis. Lay the frame or door face down on a flat, even surface. Cover the back of the frame or door with the Design Vellum and secure with painter's tape or masking tape in order to prevent the paper from moving during tracing. Remove the paper from the frame or door and connect the corners using your straight edge and pencil. Write within the template border lines - "top" and "bottom" and "front" and "back". Cut out the template and place in the opening(s) to ensure accuracy. If more than one door is required, try the template in every opening to make sure it works for all. Template cuts are custom orders and will be priced on a per order basis. Please send us your requirements for a prompt quotation by clicking here. Please call us at (800) 221-7379, Option 6 (9:00 am - 5:00 pm EST) for additional assistance. We invite you to click here to begin your selection process. You can also contact us through our online form. We are at your service.